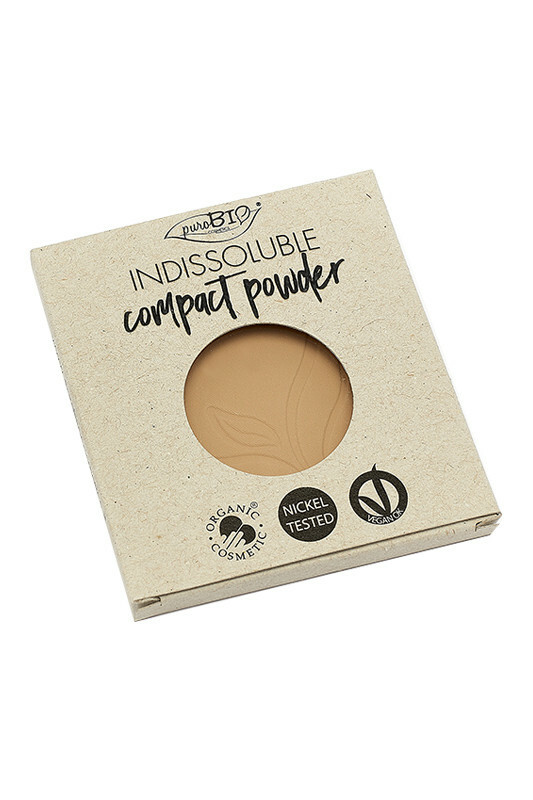 The Purobio Vegan "Indissoluble" Compact Powder is perfect to unify and mattify your complexion for a natural result! Talc-free, it contains organic corn starch, organic rice powder to fix your foundation with a silky velvety finish. Shea butter, apricot oil, avocado oil and macadamia oil are ingredients rich in vitamin E, known for their nourishing, antioxidant and anti-aging skin benefits. 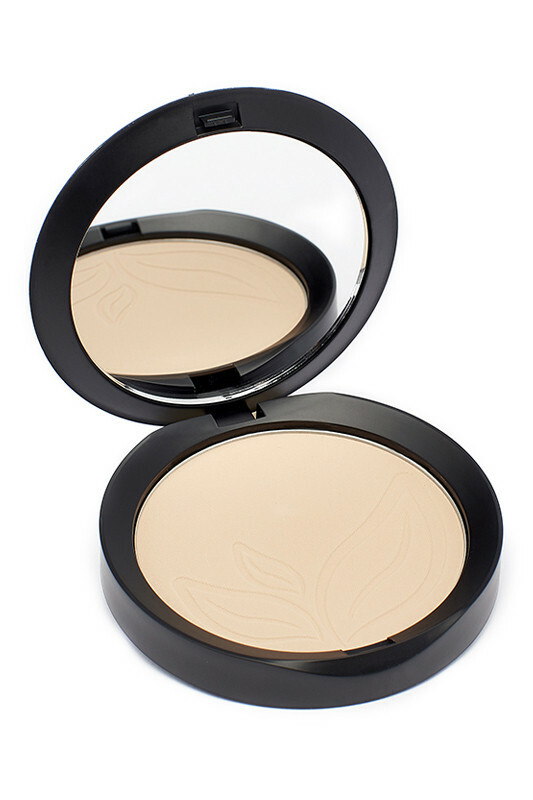 Purobio Organic Compact Powder prolongs make-up hold and gives your complexion a healthy glow! Thanks to its rechargeable magnetic system: replace your powder by choosing a different shade or to recharge once the product is finished! J'aime beaucoup ce produit, il a une bonne couvrance, parfait pour les peau mixte à grasse, il a un finis poudré sans pour autant marquer mes zones de sécheresse ! 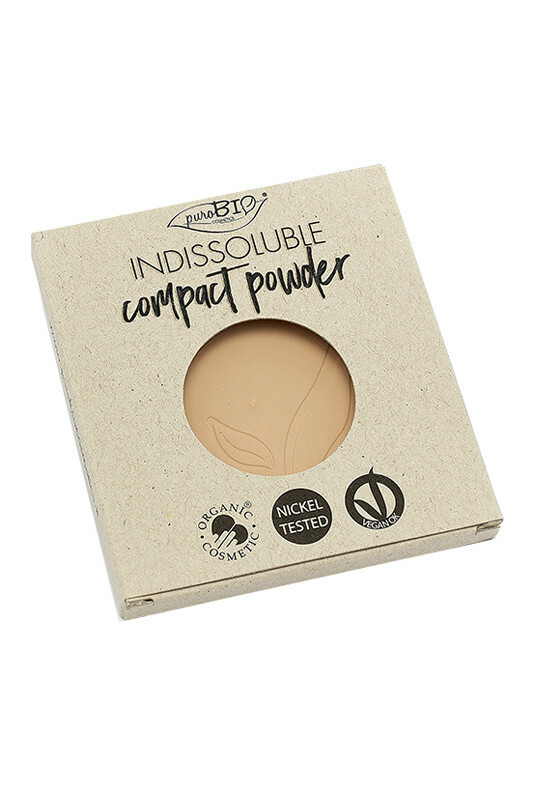 Fix your foundation with PUROBIO Indissoluble Compact Powder! 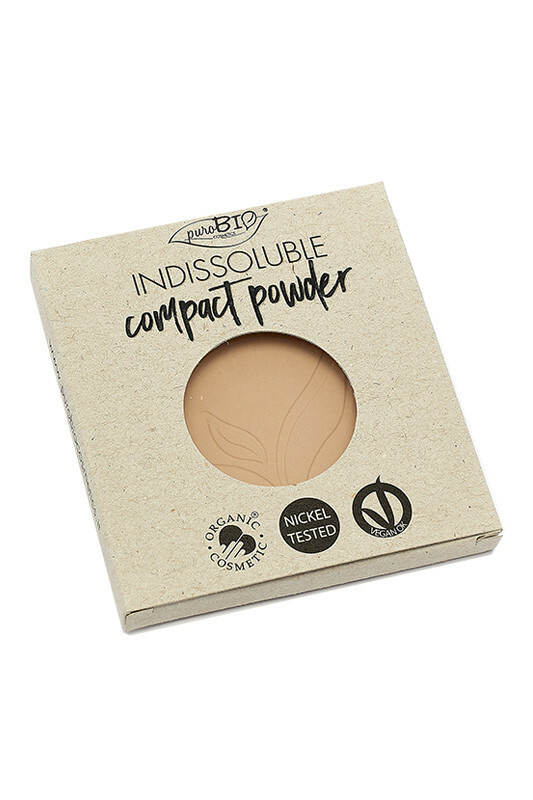 Apply Purobio Organic Compact Powder using powder brush for a natural result. Delicately take some powder with the brush, tap off the excess then apply it on the face. 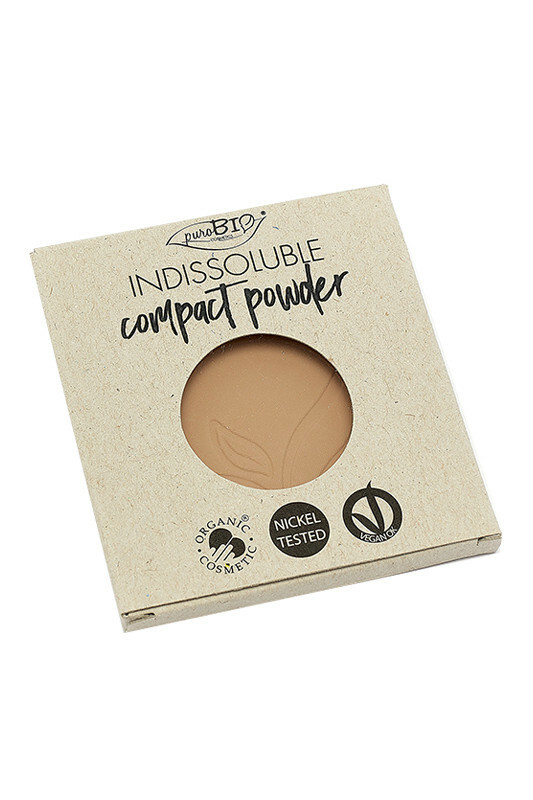 Purobio "INDISSOLUBLE" Vegan Powder is guaranteed talc-free & nickel-free! INCI 01 : MICA, ZEA MAYS STARCH (ZEA MAYS (CORN) STARCH)*, SILICA, SQUALANE, ZINC STEARATE, GLYCERYL CAPRYLATE, TOCOPHEROL, FRAGRANCE, ORYZA SATIVA POWDER (ORYZA SATIVA (RICE) POWDER)*, BUTYROSPERMUM PARKII BUTTER (BUTYROSPERMUM PARKII (SHEA) BUTTER)*, MACADAMIA TERNIFOLIA SEED OIL*, PRUNUS ARMENIACA KERNEL OIL (PRUNUS ARMENIACA (APRICOT) KERNEL OIL)*, PERSEA GRATISSIMA OIL (PERSEA GRATISSIMA (AVOCADO) OIL)*, PONGAMIA GLABRA SEED OIL, LIMONENE, CITRONELLOL. MAY CONTAIN +/-: CI 77891 (TITANIUM DIOXIDE), CI 77491 (IRON OXIDES), CI 77492 (IRON OXIDES), CI 77499 (IRON OXIDES). INCI 02 : MICA, ZEA MAYS STARCH (ZEA MAYS (CORN) STARCH)*, SILICA, SQUALANE, ZINC STEARATE, GLYCERYL CAPRYLATE, TOCOPHEROL, FRAGRANCE, ORYZA SATIVA POWDER (ORYZA SATIVA (RICE) POWDER)*, BUTYROSPERMUM PARKII BUTTER (BUTYROSPERMUM PARKII (SHEA) BUTTER)*, MACADAMIA TERNIFOLIA SEED OIL*, PRUNUS ARMENIACA KERNEL OIL (PRUNUS ARMENIACA (APRICOT) KERNEL OIL)*, PERSEA GRATISSIMA OIL (PERSEA GRATISSIMA (AVOCADO) OIL)*, PONGAMIA GLABRA SEED OIL, LIMONENE, CITRONELLOL. MAY CONTAIN +/-: CI 77891 (TITANIUM DIOXIDE), CI 77491 (IRON OXIDES), CI 77492 (IRON OXIDES), CI 77499 (IRON OXIDES). INCI 04 : MICA, ZEA MAYS STARCH (ZEA MAYS (CORN) STARCH)*, SILICA, SQUALANE, ZINC STEARATE, GLYCERYL CAPRYLATE, TOCOPHEROL, FRAGRANCE, ORYZA SATIVA POWDER (ORYZA SATIVA (RICE) POWDER)*, BUTYROSPERMUM PARKII BUTTER (BUTYROSPERMUM PARKII (SHEA) BUTTER)*, MACADAMIA TERNIFOLIA SEED OIL*, PRUNUS ARMENIACA KERNEL OIL (PRUNUS ARMENIACA (APRICOT) KERNEL OIL)*, PERSEA GRATISSIMA OIL (PERSEA GRATISSIMA (AVOCADO) OIL)*, PONGAMIA GLABRA SEED OIL, LIMONENE, CITRONELLOL.